Most of you out there probably only use liquor stores for stocking up your house parties or finding the perfect host gift. You have your go-tos that you simply grab off the shelf with nary a thought before you dash back out the store. Because, if you just allowed yourself to linger and peruse the shelves, it could be a bit overwhelming. Who knew there were THAT many different whiskies? 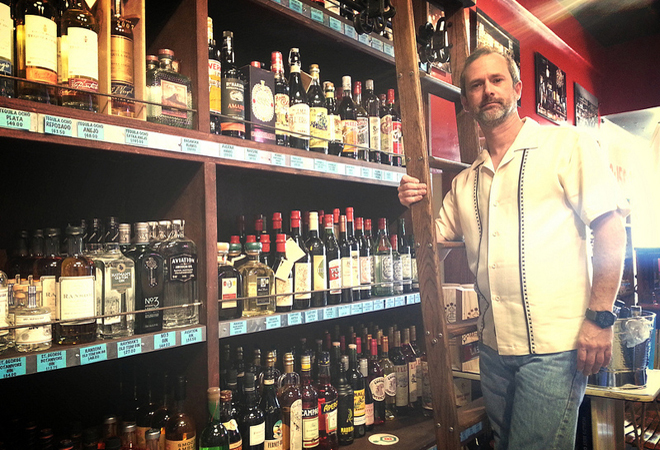 So in this recurring series, I go straight to the source—the spirits buyers from your favorite L.A. liquor stores—for the best deals, hidden gems and what bottle is THE one to have. Owner Joe Keeper first opened his store Bar Keeper in Silver Lake nearly nine years ago in answer to the cocktail renaissance that was just germinating in New York. Since then, his little shop has become an integral part of L.A.’s own cocktail culture and history. It’s where the very first meeting of Sporting Life—the city’s bartenders guild—was held. Louis Anderman of Miracle Miles Bitters got the idea to go into the bitters business there. And Bar Keeper has become the go-to, one-stop shopping spot for cocktail enthusiasts, home bartenders, and pro mixologists. Joe doesn’t just sell drink paraphernalia, he sells the cocktail lifestyle. You’ll find a selection of vintage glassware, the best barware, an extensive bitters selection, and hand-picked spirits inventory. Needless to say, every item in that store is on my wishlist. Should you find yourself overwhelmed while standing before Bar Keeper’s wall of booze, here are a few of Joe’s own picks if you’re too shy to ask him yourself. ➼ Bar Keeper has an impressive bitters selection. What’s your favorite out of your inventory? Bar Keeper carries well over 100 different types of additive bitters as well as many potable bitters. I separate the two types because they are used in different manners. Many of my customers are unfamiliar with additive bitters and their purpose. My go-to example is to think of additive bitters as spices for the cocktail. People add salt to a steak to make it taste better, not to make the steak salty. So, too, is the purpose of bitters. They are used to accentuate and/or bring out the organic flavors found in the spirit. They are NOT modifiers. If the goal is to have a Rhubarb cocktail use Rhuby. If, however, the goal is to accentuate the sweet fruitiness in a spirit, then use Rhubarb bitters. My favorite bitters are Louis Anderman’s Miracle Mile Bitters. Louis understands the purpose of bitters and caters to the prosumer and the professional mixologist. The flavors are bold and bright. They demand a person who knows just the correct amount without overdoing it. ➼ The next big thing in liquor is ________?